Maritime authorities intervened to stop a National Geographic crew from baiting sharks off the coast of Long Beach in the midst of a local panic about great white sharks appearing near the shore, according to a local news report. 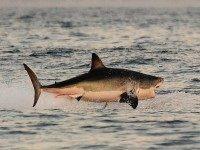 Video has been released of a March 18 incident in which a great white shark attacked a kayaker. 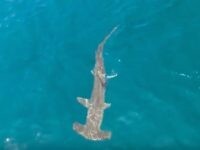 A hammerhead shark, one of two seen last Thursday, was captured on video lazily swimming in the waters off the coast of Newport Beach. 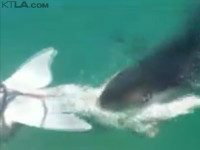 A fisherman kayaking in the Pacific Ocean near Los Angeles caught a leopard shark — and soon found himself in a fierce tug-of-war with a great white shark. 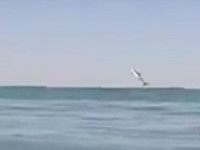 Two friends who were surfing in Huntington Beach on Monday were able to capture the rare and awesome sight of a juvenile great white shark breaching the surface and jumping up into the air. 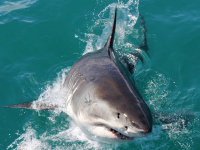 On Tuesday, a marine biologist who is also a kayak guide had what could have been a frightening experience for anyone else: a great white shark swam directly under his kayak. 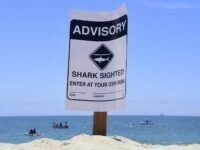 Seal Beach has begun using a $1,400 drone to monitor juvenile great white shark activity and sightings off the coast of Surfside, following unusual shark sightings off the coast of Surfside and near neighboring beaches since this past April.